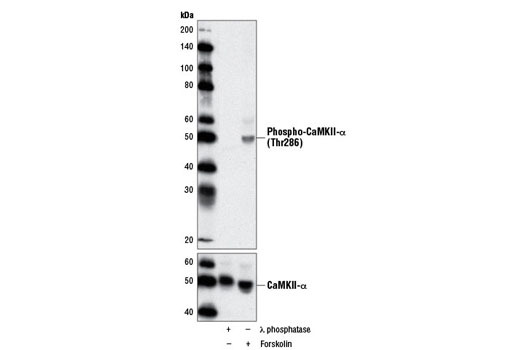 Western blot analysis of extracts from MKN-45 cells treated with λ-phosphatase or Forskolin #3828 (30 μM, 20 min) using Phospho-CaMKII (Thr286) (D21E4) Rabbit mAb (upper) and CaMKII-α (D10C11) Rabbit mAb #11945 (lower). 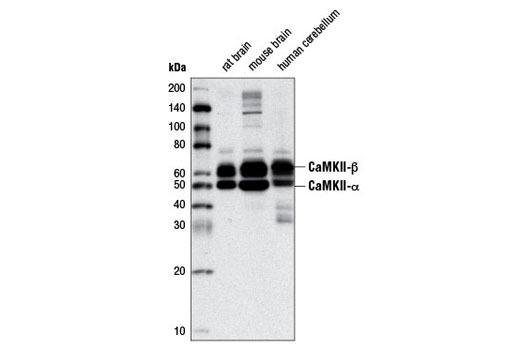 Western blot analysis of extracts from rat brain, mouse brain and human cerebellum using Phospho-CaMKII (Thr286) (D21E4) Rabbit mAb. 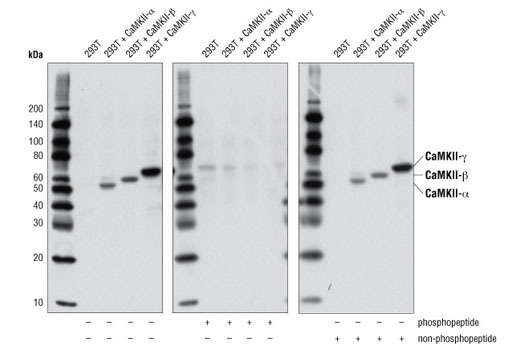 Western blot analysis of extracts from 293T cells, untransfected or transfected with specific CamKII proteins as indicated, using Phospho-CamKII (Thr286) (D21E4) Rabbit mAb. Antibody phosphospecificity was verified by preincubating the antibody in the absence of a peptide (-) or with either CamKII-β (Thr287) phosphopeptide (+) or CamKII-β (Thr287) non-phosphopeptide (+) prior to incubating the membrane. Phospho-CaMKII (Thr286) (D21E4) Rabbit mAb recognizes endogenous levels of CamKII-α protein only when phosphorylated at Thr286. This antibody also recognizes endogenous levels of CamKII-β and CamKII-γ protein only when phosphorylated at Thr287. Monoclonal antibody is produced by immunizing animals with a synthetic phosphopeptide corresponding to residues surrounding Thr287 of human CamKII-β protein.